A 30th birthday celebration seemed a like a good excuse for dinner at Alana’s. I have been waxing lyrical since my last visit and apparently my enthusiasm was enticing. What we did not know was that it was also Alana’s birthday, and whilst many people would be tempted to take a night off for such an occasion, she excelled herself in the kitchen instead. 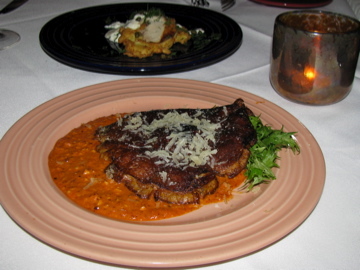 Since the publication of the Dispatch’s Top Ten Restaurant list of 2008, there has been some debate on Columbus Underground about whether Alana’s belongs in the Top Ten. 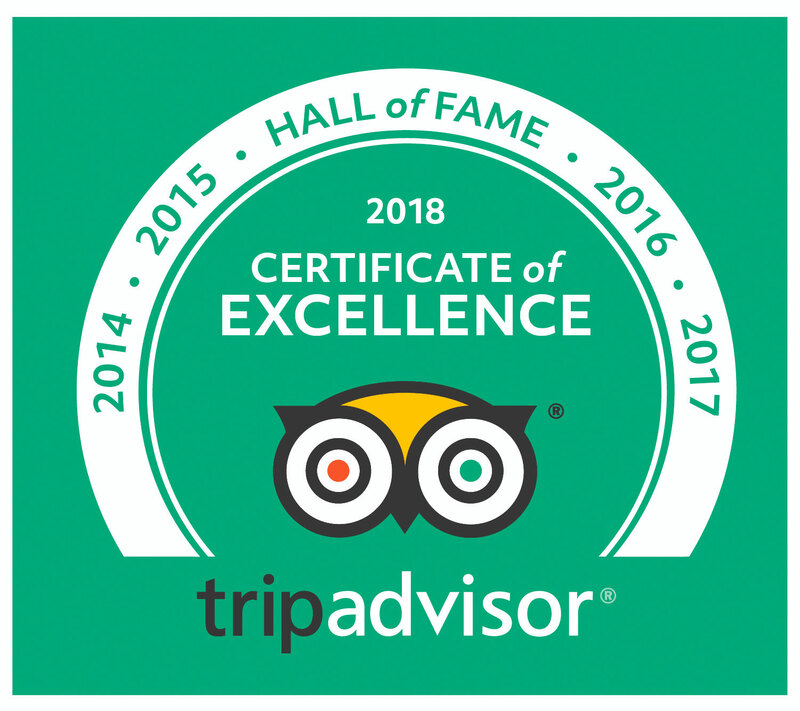 Having only been to half of the restaurants in their top ten and visiting most of those only once, I cannot comment on their selection, but I can say that Alana’s is one of my favorites. 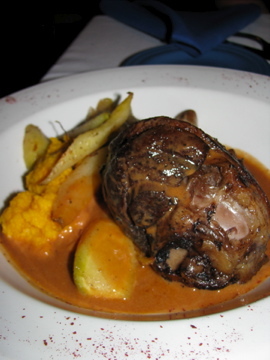 This is partly because of the excellent food but also the general ambience, size and service. I don’t like restaurants that are too big or pretentious, that try too hard or have menu’s like books. I do like a comfortable atmosphere, delicious food and thoughtfully prepared fresh, local ingredients. Alana’s is a converted house with a series of small rooms and I think for me that adds to the informal air. On my first visit, I missed the large bookshelf of cookbooks and sitting right by it this time, I found it hard resisting the urge to turn around and peruse the selection. As dining companions generally do not appreciate one having dinner with one’s head in a book, my love of reading cookbooks might be an excuse for a solo dinner. As there were five of us, I was able to try quite a few things from the menu – a relief as it was almost impossible to choose. Everything sounded so good. Even though we tried 5 of the 6 starters on the menu, we looked with some regret at the missing sixth as it passed by to another table. Tandoori sweet potato soup. One of our party deemed this so delicious that they could eat it every day and it was wonderful. Smooth and spicy but not overly spiced, sweet or rich. 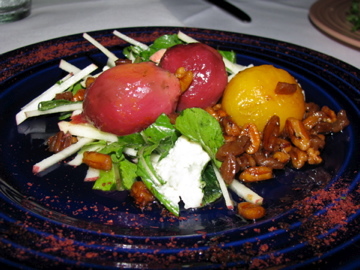 Roasted candy striped and golden beets with Ohio apples, arugula, blue cheese and pecan brown butter. 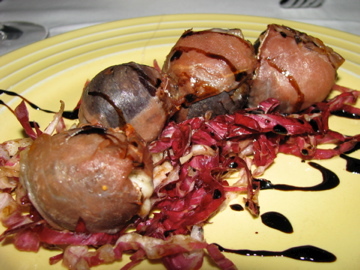 Hudson valley prosciutto wrapped black mission fig stuffed with gorgonzola and balsamic syrup. 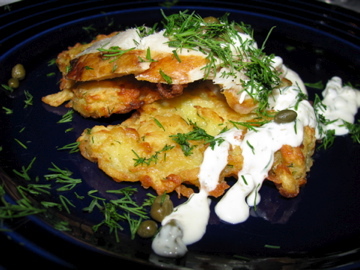 Parsnip pancake with smoked blue fish and lemon caper crème fraîche. The one we didn’t have was Florida pink shrimp pepperonata. The beets won the prize for the most beautiful presentation and the parsnip pancake was the favorite. The figs were a wonderful melding of flavors and went really well with the wine, a magnum of Penner-Ash Pinot Noir (2006), ably suggested by Gideon. No photos of the two salads we tried: arugula, bartlett pears and blue cheese tossed in a pear balsamic vinaigrette with candied walnuts and frisée with shaved pink turnips, radishes, candy onions carrots, micro greens and totally tiny croutons, tossed in a dijon vinaigrette. I love the way that if you are sharing a dish, they bring it out on two separate plates so that you don’t have to ask for two plates and then try and halve it yourself at the table. My main course was my highlight of the meal. 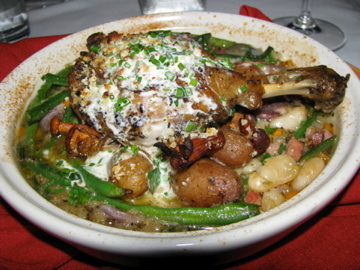 Fall cassoulet with the last the summer green beans, purple limas and cannellini beans, fingerling potatoes, blues creek ham, confit of duck leg and fruit of the moon shiitake crust. It was piping hot, salty and fresh tasting and flavorful and extremely satisfying without being overly rich. The other main course of choice at our table was the braised lamb shank with caraway smashed celeriac and carrots with roasted white satin carrots and yoghurt nage. I was sad not to be able to try the rustichella spagetti with fresh rock shrimp, trinity, manchego and pepito pesto which also looked good as it whizzed past and I was intrigued by the kabocha pumpkin risotto with caramelized butternut, roasted turkey, gouda and cranberry juice, that sounded like Thanksgiving in a bowl. Luckily not a chance of excessive whining – which, as it is stated on the menu, comes with a $39 price tag. 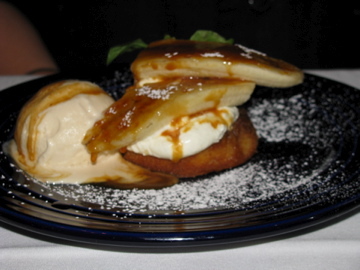 You may think that we didn’t have room for dessert, but thankfully you were wrong. It was a birthday dinner after all. 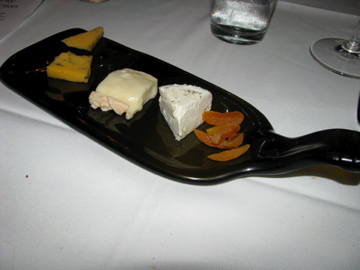 I had the cheese plate, which was served on a melted down magnum. Apparently a friend of Alana’s makes them from magnums drunk at the restaurant. The cheeses were purple haze chevre with fennel pollen and lavender; taleggio and cotswold cheddar, flavored with onion and chive. I could have done with a more varied bread or cracker selection but the cheeses were fantastic. The desserts were all hits, from what I could tell from the murmuring around me, although I think the bread and butter pudding won the most accolades. 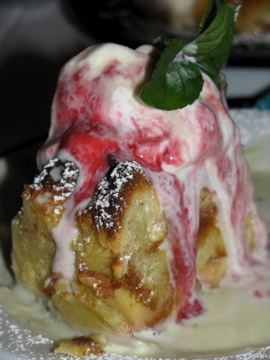 Plum bread and butter pudding with raspberry and coriander ice cream. I couldn’t get a photo before if was half devoured. 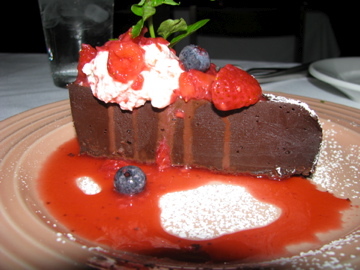 A stunning dark chocolate torte with macerated berries. When is the next birthday? ……Or maybe you will be able to find me having dinner with a pile of cookbooks.